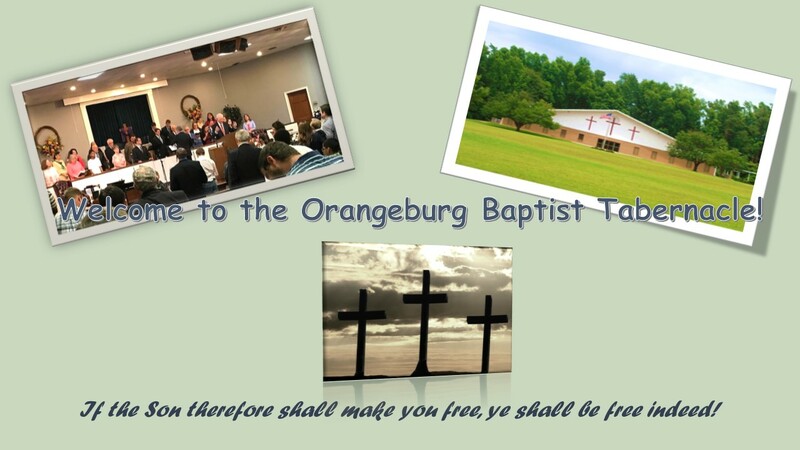 Thank you for visiting our the online home of the Orangeburg Baptist Tabernacle. We are a local, fundamental, independent Baptist Church whose mission is to know Christ and to make Him known. We invite you to learn more about us by browsing our website. We would also like to extend an invitation to you to visit us at our next service. We have a variety of ministries geared toward all ages. If there’s any way we can be of service to you or your family, please let us know. Morning Service and Children's Ministry 11:00 A.M.
Evening Bible Study and Prayer Meeting 7:00 P.M. Teens for Christ 7:00 P.M.
Children's Bible Study 7:00 P.M.